This momentum strategy is very straightforward. 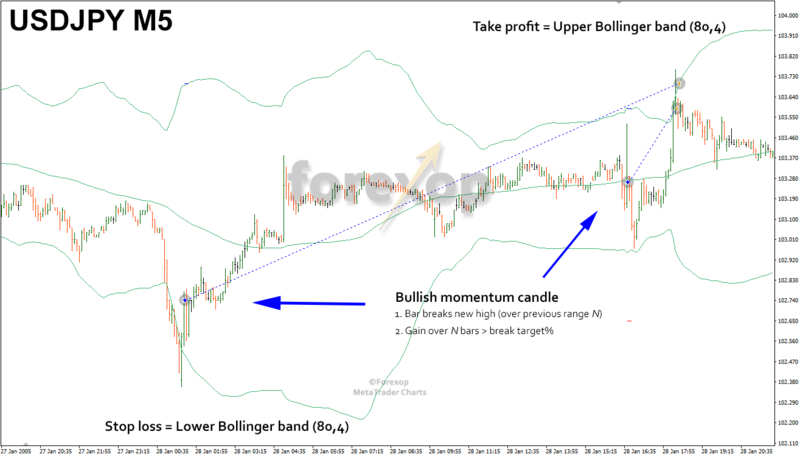 All you need is the Bollinger bands indicator and to do some basic checking of chart candles. 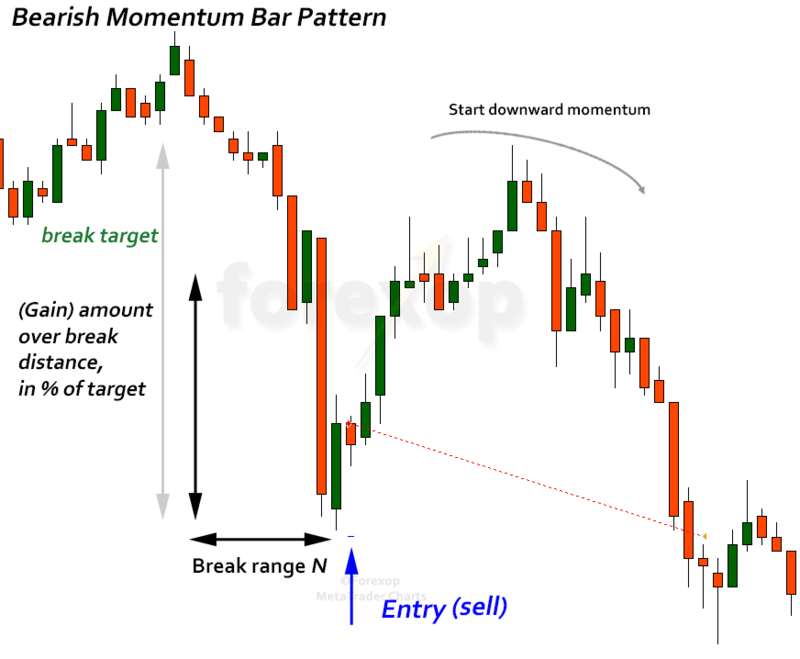 It works on chart patterns that display signs of pending momentum – that is upward or downward acceleration in price. Looking at “price action” means looking down to the level of individual bars (candles) on the chart. 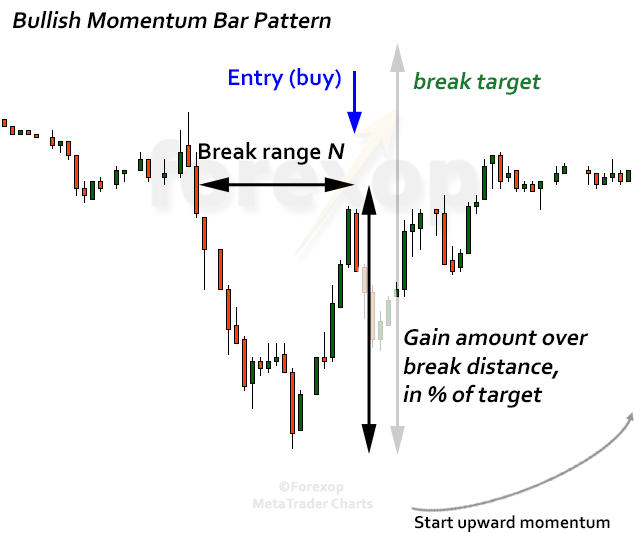 As this is a price action strategy it makes it ideal as a day trading system or for quick in-out trades. Price momentum means that the price is changing rapidly and forming an upward or downward trend. To satisfy the trading condition, there are two separate rules. Firstly the current bar must have broken a new high (low for sell). Secondly the candle pattern must have risen (fallen for a sell) by an amount equal to a break range over a set number of bars. Theory: The first condition guarantees that the price has broken out of any nearby resistance/support and it is not range bound. The second condition guarantees that the price is accelerating in the desired direction by an amount that gives a reasonable chance of a profit being achieved. These together satisfy the condition that “price momentum” is emerging. Only closed bars are considered – that is where the high/low and open/close are all known. For example let’s suppose, N=6 bars, Break Target=0.5%. This means I will buy when the price of the last closed bar has risen by more than 0.5% over the previous 3 bars, and the high of the last closed bar is above the highs achieved over the previous 6 bars. I will sell when the price of the last closed bar has fallen by more than 0.5% over the last 3 bars, and the low of the last closed bar is below the lows reached over the previous 6 bars. If you are using a chart at a higher or lower time scale you will need to adjust these settings accordingly. For example, with most currencies it’s rare to see the price rising by more than 0.5% over 3 bars on the one minute chart. On the other hand on the one hour, four hour and daily charts such price changes are not unusual. The diagrams below explain the trading rules. The trading rules can be loosened or tightened accordingly to produce more or fewer trade entries. When you increase N, the break range this means the high (or low in the case of a sell) of the last closed bar must have made a more significant upward break than when N is set to a smaller value. In other words, you are looking for larger and more significant chart patterns. When you increase N, it also makes sense to increase the Break Target. For instance, you’d be more likely to see a price rise of 1% over 20 bars than you would over 2 bars. With a stricter filter, you will get fewer trades but usually ones that are higher quality. The table below demonstrates this. There were four test runs on the USDJPY five minute chart where each run uses a different break target. Volume was 0.01 lots per trade. With a break target at 0.12% only 367 trades are accepted but the payoff per trade is $2.17 (about 22 pips). With a break target of 0.1% there are 619 trades but the expected payoff is lower at $1.5 (about 15 pips). The profit factor is also lower. 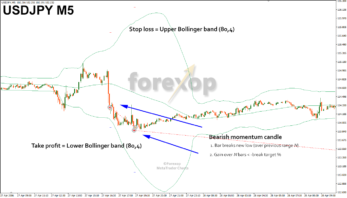 The stops and profits I use with this system are taken from the Bollinger bands. In the examples shown I’ve used a Bollinger band with period 80 and 4 deviations. On the buy side, the take profit is set to the upper Bollinger band at the current bar. The stop is taken as the bottom Bollinger band at the same bar position. The sell side is just the reverse. The take profit is set to the lower band and the stop loss is the upper band. Examples are shown in the figures below. Theoretically there is a chance that the bands give an invalid stop or take profit. This could happen for example when you have a long candle that extends outside of the bands. In this case, the take profit for a buy could be below the current level. Or the stop loss for a buy could be above the current price. The reverse situation for a sell could also give an invalid stop or take profit. With the wide band settings I’ve used this is less likely to happen, but just in case I add a buffer either side of the bands so that the stop and profit levels will always be valid. Another option is to use minimum thresholds for the stop and profit distance to avoid any invalid cases. When using Bollinger bands to set your trade exits there won’t be a deterministic ratio of profit and loss on each trade. 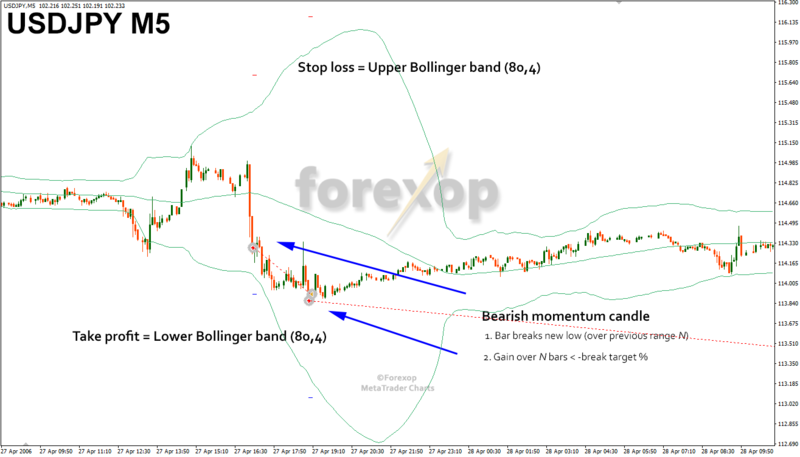 For example, with a buy side trade when the price is attracting towards the lower Bollinger band the stop distance will be much smaller than the profit distance. The reverse happens when the price is attracting towards the top of the band. Here the stop can be much bigger than the profit distance. As I’ve explained in more detail in my other article, there isn’t necessarily any advantage or disadvantage to this. What is very important though is that any succession of losses is easily survivable and that boils down to sensible money management. 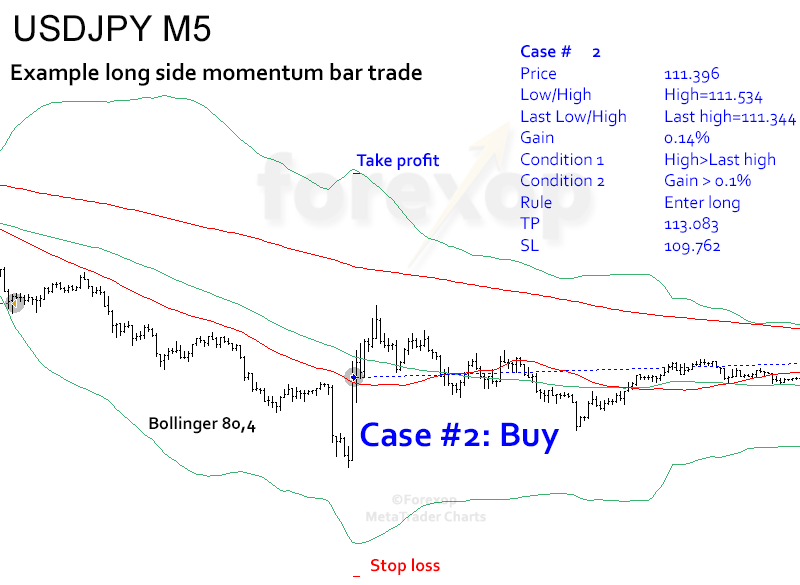 To see an example of the entire trade sequence let’s look at two cases on the USDJPY five minute chart. A sell-side trade entry happens at the bar shown in Figure 5 below. In this example, I’ve used a break range (N) of 6 bars, and minimum break target of 0.1% of price. The actual values from the chart are shown in the table below. 1) The low on the last closed bar is 102.846 and this is below the last low over the previous 6 bars. The upper Bollinger (80,4) band is at 106.713. The stop loss is set to this value. The lower Bollinger band is at 102.384 and the take profit is set to this level. 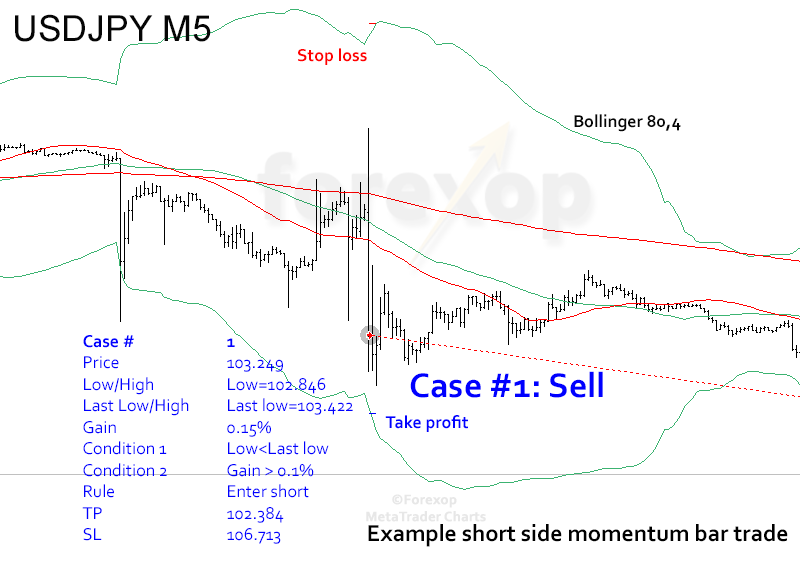 This produces a take profit of 86 pips and a stop loss of 346 pips. The complete trade setup is shown in Figure 5. The high on the last closed bar is 111.534 and this is above the high reached on the previous 6 bars. The gain over the last 3 bars was 0.14% (for buy side) which is more than 0.1% of price. The lower Bollinger band is at 109.762 and this becomes the stop loss level. The upper Bollinger band is at 113.083 and this becomes the take profit. This gives a potential profit of 168 pips and a potential loss on the trade of 163 pips. Figure 6 shows the complete trade sequence. 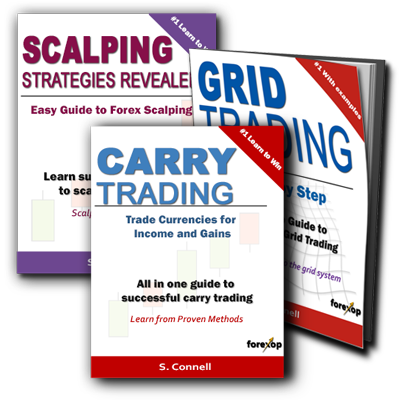 The back tests were done over a 10 year time frame using five minute charts. The starting balance was $10,000 USD in each case. The test runs are shown in the table below. I used the same settings as the examples given above. As I mentioned, the number of trades and reliability of trade entries can be increased or decreased as necessary by adjusting the input parameters. Stricter conditions will result in fewer trades as this will filter more entries with a low probability of a profitable outcome. On the other hand looser conditions will increase the number of trades but expect on average more “lower quality” trade entries to pass through the filter. Hello, you have created a EA based on this strategy ? Can you share it please ? The EA is used for testing purposes but possibly could be shared at a later date. I am fascinated about your write up and the vast experience you have in trade and my question goes thus; how do we no fake online traders/broker. Could this system be traded manually with a reasonable expectancy? It seems like the small profits could be wiped out with a human margin of error. Yes it can be traded manually as it is a simple trading rule. The expectancy is based on volume “0.01 lots” as this was the size in the test runs. But yes the profit line is fairly tight so you have to be careful.